After all the hype and hearing about Wenger's Delhi Nutella Waffle i decided to visit the place and check the taste myself. I went there on a Saturday evening and asked for a Nutella waffle. The guy at the cash counter tole me he already has 14 pending orders for this particular waffle and i will have to wait for 1 hour. I couldn't do that so decided to come some other time. On another Saturday afternoon i.e 4th feb 2017 , i made a visit to this place again and got my order in about 25 minutes. I didn't manage to find a seat for myself though. I didn't find the waffle extraordinary. The vanilla was less in comparison to the waffle size. The waffle had less Nutella which was giving it a dry taste and hence difficult to eat it after the vanilla got over. 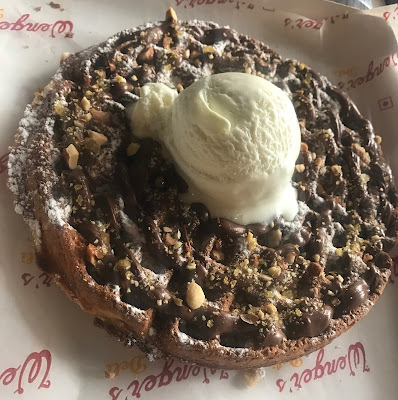 The Nutella waffle was priced at Rs.220/- and hence giving a proportionately extra vanilla should not be an issue for them. If you are a waffle fan , then do try this out yourself. If you are not a waffle lover, just skip this one. You won't cherish it.